Tunisia will always be remembered as the country that started the Arab Spring. The wave of protests that began there toppled several dictators, from its own President Zine El Abidine Ben Ali, to Egyptian President Hosni Mubarak and Libyan strongman Muammar Qaddafi. It also contributed to the start of the civil war in Syria. In most of the countries that saw Arab Spring uprisings, the struggle for democracy has suffered serious setbacks. In contrast, the transition in Tunisia from 23 years of dictatorship to a fully-fledged working secular democracy seems to be heading in the right direction. Yet, the transition remains fragile. Following the Jasmine Revolution in 2010/11, triggered by Mohamed Bouazizi’s self-immolation in protest against a lack of opportunity and political say, Tunisia has been working hard to ensure a clean break with its recent past. In January 2014, the country adopted a new constitution that focuses on transparency and states one of its aims as “breaking with injustice, inequity, and corruption.” In February 2015, Tunisia formed its first post-transition government after free and fair elections the previous year. The dedication to live up to the revolution’s goals pervades Tunisian society and institutions, and has been praised by international organizations. The Nobel Peace Prize for 2015 was awarded to the Tunisian National Dialogue Quartet, an alliance of Tunisian workers, employers, lawyers and activists, which was formed in 2013 when the democratization process was in danger of collapsing because of political assassinations and widespread social unrest. 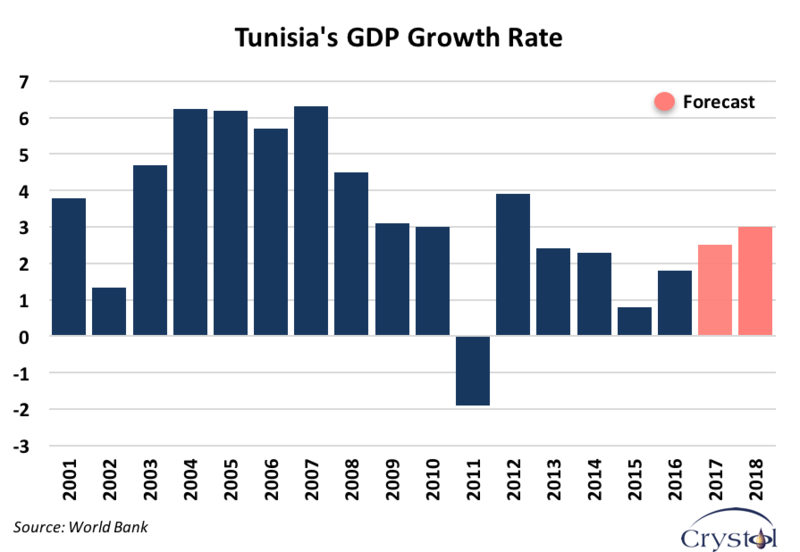 Tunisia’s economic growth collapsed in 2011: its gross domestic product (GDP) shrank by 1.9 percent, after averaging 5 percent in the previous decade. It jumped to 3.9 percent in 2012, so far its fastest post-revolution growth rate. Following the terrorist attacks in 2015, growth fell to less than 1 percent. In 2016, it reached a rather deceiving rate of 1.5 percent, primarily because of limited investment. The unemployment rate remains high, at 15 percent. Youth unemployment has been rising since mid-2014 and is estimated at 35 percent. Tunisia’s main economic sectors include agriculture, industry (primarily petroleum and mining), textiles and tourism. Only the agricultural sector has supported economic growth over the past two years. The textile industry is increasingly facing competition from Asia, while the tourism sector is the first victim of terrorism. The oil and gas industry has encountered several problems, both technical and commercial, worsened by an adverse investment climate. Tunisia is not a big oil and gas producer, but given the state of this small economy, every little bit helps. Besides, Tunisia’s resource potential may be much larger than what it is known today, especially considering its shale resources. According to the Energy Information Administration (EIA), Tunisia’s proven oil reserves are approximately 425 million barrels (Mb), while its proven gas reserves are only 56 billion cubic meters (bcm). Its technically recoverable shale oil and gas resources are 1,500 Mb and 644 bcm respectively and have yet to be explored. 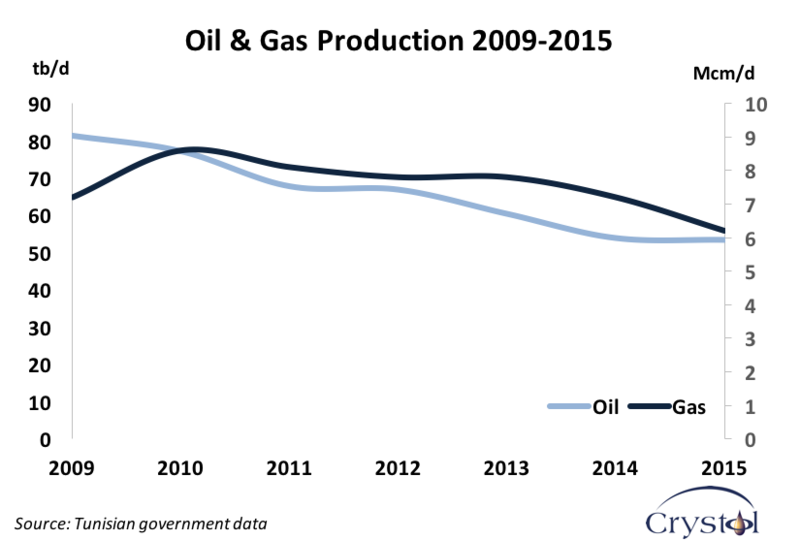 Production from both conventional oil and gas is declining. Oil production has been steadily falling from its peak of 120 thousand barrels per day (tb/d) in the mid-1980s to 53 tb/d in 2015, declining by 30 percent since 2010. Gas production peaked in 2010 at around 9 million cubic meters (Mcm) daily, and reached 6.2 Mcm per day in 2015 – a drop of 31 percent. Such poor production performance is partly due to natural declines at (mostly small) existing fields and required maintenance work, as well as limited investment in exploration. Production also suffered because of strikes and social unrest. The unstable security situation has not directly impacted exploration and production activities. It has, however, increased the cost of doing business in the country, because companies have to spend more on security. 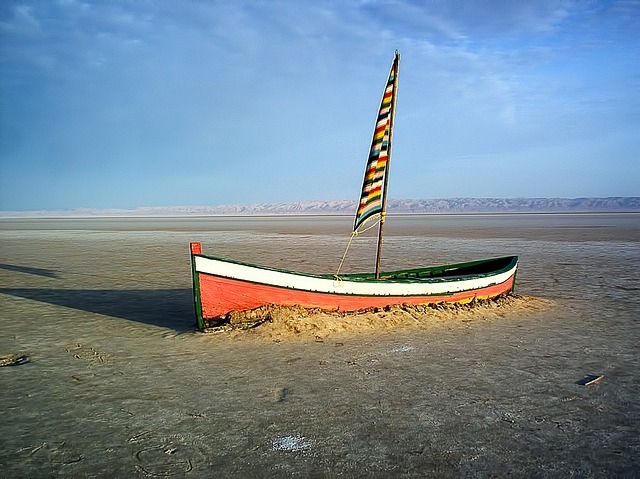 Now that oil prices are far lower than they were during the period between 2010 and the summer of 2014, international companies find investment in Tunisia less appealing. Additionally, social unrest has disrupted some companies’ operations, particularly in the impoverished south of the country, where most of Tunisia’s oil and gas fields are located. Petrofac, a British firm, had to halt is gas production at the Chergui plant in the Kerkennah Islands for most of 2016 because of protests. The Tunisian government had to import gas from Algeria to compensate for the shortfall at a cost of around $100 million. The protests were triggered by a campaign promoting the slogan “Where is the oil?” and fueled by anger over the lack of job opportunities. Protesters accused the government and the companies of signing contracts that did not benefit the local population. Bruised by years of corruption, the citizens demanded that the contracts be made public. In response, the government published 50 oil and gas contracts – a bold and welcome step that many other countries still shy away from. The initiative is also in line with the government’s pledge to fight corruption and should send a positive signal to the locals and the international community. On its own, however, transparency will not be enough to tame existing discontent: boosting economic growth and creating jobs remain essential. These two objectives require an improved business environment. Fluctuations in the oil price have been a mixed blessing for Tunisia. Lower prices have provided some economic relief. Above all, they helped the government implement reforms, such as reducing energy subsidies. Because Tunisia’s oil production is low, the reduction in energy subsidies (which saved the government the equivalent of about 1.6 percent of GDP according to the IMF) more than compensated for lower oil revenues caused by the drop in production (a loss of about 0.7 percent of GDP). Tunisia has been a net importer of energy since 2000. A combination of a declining production and an increasing local demand has increased the country’s dependence on imports. The lower oil prices have reduced the country’s import bills and narrowed the current account deficit. These benefits may be limited in 2017. The decision by the Organization of Petroleum Exporting Countries (OPEC) to cut production appears to have put a floor on oil prices at around $55 per barrel. If Tunisia’s production and consumption levels continue their current trends, this will worsen the country’s balance of payments (all else being equal) with damaging economic repercussions. The additional danger is the economic health of Tunisia’s biggest trading partner, the European Union, which absorbs about 80 percent of its exports. This worry has come into particularly sharp focus with the rise in oil prices, which tends to dampen economic growth in countries that are major consumers. The Tunisian government’s priority is to increase investment in the oil and gas sector. More investment potentially means more discoveries, which could ease the decline in production over the long term. In 2014, investment in oil and gas exploration ($194 million) was just half that of 2010 ($373 million). In 2016, just one of the 11 planned exploration wells was drilled. An improvement in the business climate could encourage capital spending. In this respect, higher oil prices will be beneficial, especially if accompanied by greater social stability. The transition in Tunisia from more than two decades of dictatorship to a properly functioning democracy will take time. When the revolution started, some experts predicted the process would last at least 10 years. On the bright side, despite the insecurity and social unrest, Tunisia’s transition has been better managed than most of the countries that saw Arab Spring protests, where similar moves toward democracy either stalled, were reversed or led to a bloody civil war. Tunisia’s economic recovery remains fragile, but expectations are optimistic. The World Bank forecasts a growth rate of 2.5 and 3 percent in 2017 and 2018 respectively. The IMF estimates a more robust increase of 4.7 percent by 2020. This cautious optimism does not downplay the magnitude of the challenges ahead. Security, political and social risks are high, dampening investor confidence. In the short term, the petroleum industry may be able to provide some relief if oil prices maintain their upward momentum, boosting investors’ appetite for risk. But the question is whether prices will reach high enough and last long enough to compensate for the dangers. In the longer term, if the government establishes a supportive institutional framework and society allows it to function properly, investment in unconventional oil and gas could make a big difference.